Make brownie mix as directed on brownie box using water, oil and eggs. Bake 20 minutes. Meanwhile, in medium bowl, mix sweetened condensed milk and egg with whisk. Pour mixture over partially baked brownie base. 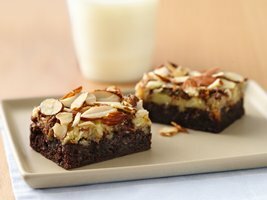 Sprinkle candy bar pieces evenly over base; top with sliced almonds. Bake 22 to 27 minutes longer or until center is set. For even more coconut flavor, stir 1/3 cup sweetened flaked coconut into sweetened condensed milk mixture. Proceed as recipe directs. 1 Serving (1 Bar)Calories 190(Calories from Fat 70),Total Fat 8g(Saturated Fat 3 1/2g,Trans Fat 0g),Cholesterol 20mg;Sodium 85mg;Total Carbohydrate 26g(Dietary Fiber 1g,Sugars 20g),Protein 3g;Percent Daily Value*:Vitamin A 0%;Vitamin C 0%;Calcium 4%;Iron 4%;Exchanges:1 Starch;0 Fruit;1 Other Carbohydrate;0 Skim Milk;0 Low-Fat Milk;0 Milk;0 Vegetable;0 Very Lean Meat;0 Lean Meat;0 High-Fat Meat;1 1/2 Fat;Carbohydrate Choices:2;*Percent Daily Values are based on a 2,000 calorie diet.